Weight: Average 2 lbs.-4.4 lbs, but can be as heavy as 6.6 lbs. Breeding Age: Not known. However, females are thought to reach sexual maturity when they reach a length of approximately 31.9 in. BZ Diet: An insect-based complete diet made at the zoo: the product is a combination of four different species of insect/larvae, which are ground to a powder and mixed with fiber and fat products, along with vitamin and mineral supplements. Then agar is dissolved in water and added to the dry ingredients and mixed. The agar is a gelatinous substance obtained from various kinds of red seaweed and used in biological culture media and as thickener in foods. Distribution: Equatorial Africa from Guinea through Sierra Leone and much of West Africa to Central Africa as far east as extreme southwestern Kenya and Northwestern Tanzania. To the south, their range extends to norther Angola and northwestern Zambia. They have also been found on the Atlantic island of Bioko. Male white-bellied pangolins are typically slightly larger than females. 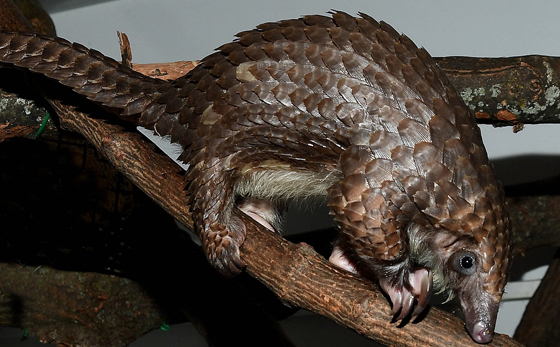 White-bellied pangolins have small pointed heads with thick eyelids that protect their eyes from bites from the ants and termites on which they feed. They have long tongues that are anchored to a point on the pelvis and which they can extend to around 9.8 in. They do not have teeth but they ingest small stones and sand that grind food in their gizzard-like stomachs. Their bodies are covered by tough three-cusped keratin scales except for most of their faces, their undersides and the inside surfaces of their legs. Their scales range in color from dark brown to russet to brownish yellow and typically comprise around 15% of their body weight. They have large curved claws which they use when climbing trees and when attacking anthills and termite mounds. They have long broad prehensile tails which are bare at the tips (which assists in gripping). White-bellied pangolins are subject to widespread and intensive exploitation for bushmeat; they are the most common of the pangolins found in African bushmeat markets. In addition, a large number of the pangolins are sold for traditional medicine and cultural practices. Habitat loss and degradation are quite possibly additional threats, especially in west Africa. The extent of these threats, when combined with the relatively slow reproduction rate of the pangolins, is thought to significantly threaten their viability. However, research to date has not been sufficiently extensive to be conclusive.